What Is The Electron Cloud Model? The early 20th century was a very auspicious time for the sciences. In addition to Ernest Rutherford and Niels Bohr giving birth to the Standard Model of particle physics, it was also a period of breakthroughs in the field of quantum mechanics. Thanks to ongoing studies on the behavior of electrons, scientists began to propose theories whereby these elementary particles behaved in ways that defied classical, Newtonian physics. One such example is the Electron Cloud Model proposed by Erwin Schrodinger. Thanks to this model, electrons were no longer depicted as particles moving around a central nucleus in a fixed orbit. Instead, Schrodinger proposed a model whereby scientists could only make educated guesses as to the positions of electrons. Hence, their locations could only be described as being part of a ‘cloud’ around the nucleus where the electrons are likely to be found. The earliest known examples of atomic theory come from ancient Greece and India, where philosophers such as Democritus postulated that all matter was composed of tiny, indivisible and indestructible units. The term “atom” was coined in ancient Greece and gave rise to the school of thought known as “atomism”. However, this theory was more of a philosophical concept than a scientific one. It was not until the 19th century that the theory of atoms became articulated as a scientific matter, with the first evidence-based experiments being conducted. For example, in the early 1800’s, English scientist John Dalton used the concept of the atom to explain why chemical elements reacted in certain observable and predictable ways. Through a series of experiments involving gases, Dalton went on to develop what is known as Dalton’s Atomic Theory. This theory expanded on the laws of conversation of mass and definite proportions and came down to five premises: elements, in their purest state, consist of particles called atoms; atoms of a specific element are all the same, down to the very last atom; atoms of different elements can be told apart by their atomic weights; atoms of elements unite to form chemical compounds; atoms can neither be created or destroyed in chemical reaction, only the grouping ever changes. By the late 19th century, scientists also began to theorize that the atom was made up of more than one fundamental unit. However, most scientists ventured that this unit would be the size of the smallest known atom – hydrogen. By the end of the 19th century, his would change drastically, thanks to research conducted by scientists like Sir Joseph John Thomson. Through a series of experiments using cathode ray tubes (known as the Crookes’ Tube), Thomson observed that cathode rays could be deflected by electric and magnetic fields. He concluded that rather than being composed of light, they were made up of negatively charged particles that were 1ooo times smaller and 1800 times lighter than hydrogen. This effectively disproved the notion that the hydrogen atom was the smallest unit of matter, and Thompson went further to suggest that atoms were divisible. 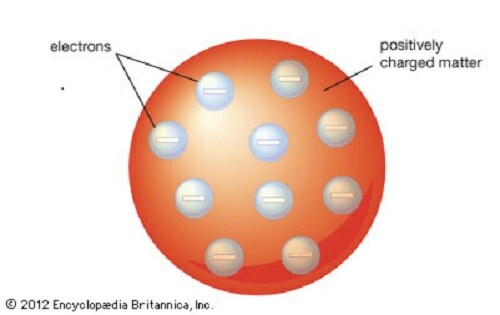 To explain the overall charge of the atom, which consisted of both positive and negative charges, Thompson proposed a model whereby the negatively charged “corpuscles” were distributed in a uniform sea of positive charge – known as the Plum Pudding Model. These corpuscles would later be named “electrons”, based on the theoretical particle predicted by Anglo-Irish physicist George Johnstone Stoney in 1874. And from this, the Plum Pudding Model was born, so named because it closely resembled the English desert that consists of plum cake and raisins. The concept was introduced to the world in the March 1904 edition of the UK’s Philosophical Magazine, to wide acclaim. In this experiment, Geiger and Marsden measured the scattering pattern of the alpha particles with a fluorescent screen. If Thomson’s model were correct, the alpha particles would pass through the atomic structure of the foil unimpeded. However, they noted instead that while most shot straight through, some of them were scattered in various directions, with some going back in the direction of the source. Geiger and Marsden concluded that the particles had encountered an electrostatic force far greater than that allowed for by Thomson’s model. Since alpha particles are just helium nuclei (which are positively charged) this implied that the positive charge in the atom was not widely dispersed, but concentrated in a tiny volume. In addition, the fact that those particles that were not deflected passed through unimpeded meant that these positive spaces were separated by vast gulfs of empty space. By 1911, physicist Ernest Rutherford interpreted the Geiger-Marsden experiments and rejected Thomson’s model of the atom. Instead, he proposed a model where the atom consisted of mostly empty space, with all its positive charge concentrated in its center in a very tiny volume, that was surrounded by a cloud of electrons. This came to be known as the Rutherford Model of the atom. Subsequent experiments by Antonius Van den Broek and Niels Bohr refined the model further. While Van den Broek suggested that the atomic number of an element is very similar to its nuclear charge, the latter proposed a Solar-System-like model of the atom, where a nucleus contains the atomic number of positive charge and is surrounded by an equal number of electrons in orbital shells (aka. the Bohr Model). During the 1920s, Austrian physicist Erwin Schrodinger became fascinated by the theories Max Planck, Albert Einstein, Niels Bohr, Arnold Sommerfeld, and other physicists. During this time, he also became involved in the fields of atomic theory and spectra, researching at the University of Zurich and then the Friedrich Wilhelm University in Berlin (where he succeeded Planck in 1927). In 1926, Schrödinger tackled the issue of wave functions and electrons in a series of papers. In addition to describing what would come to be known as the Schrodinger equation – a partial differential equation that describes how the quantum state of a quantum system changes with time – he also used mathematical equations to describe the likelihood of finding an electron in a certain position. This became the basis of what would come to be known as the Electron Cloud (or quantum mechanical) Model, as well as the Schrodinger equation. Based on quantum theory, which states that all matter has properties associated with a wave function, the Electron Cloud Model differs from the Bohr Model in that it does not define the exact path of an electron. Instead, it predicts the likely position of the location of the electron based on a function of probabilities. The probability function basically describes a cloud-like region where the electron is likely to be found, hence the name. 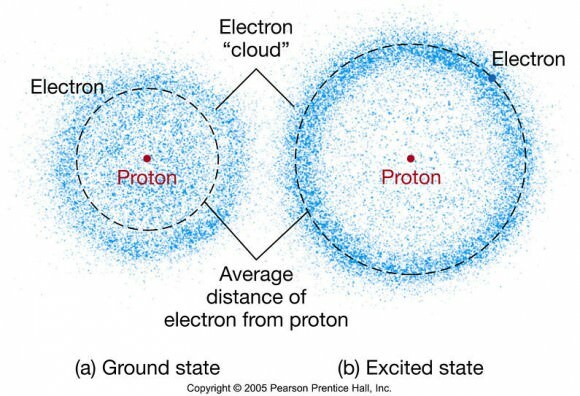 Where the cloud is most dense, the probability of finding the electron is greatest; and where the electron is less likely to be, the cloud is less dense. These dense regions are known as “electron orbitals”, since they are the most likely location where an orbiting electron will be found. Extending this “cloud” model to a 3-dimensional space, we see a barbell or flower-shaped atom (as in image at the top). Here, the branching out regions are the ones where we are most likely to find the electrons. Thanks to Schrodinger’s work, scientists began to understand that in the realm of quantum mechanics, it was impossible to know the exact position and momentum of an electron at the same time. Regardless of what the observer knows initially about a particle, they can only predict its succeeding location or momentum in terms of probabilities. At no given time will they be able to ascertain either one. In fact, the more they know about the momentum of a particle, the less they will know about its location, and vice versa. This is what is known today as the “Uncertainty Principle”. Note that the orbitals mentioned in the previous paragraph are formed by a hydrogen atom (i.e. with just one electron). When dealing with atoms that have more electrons, the electron orbital regions spread out evenly into a spherical fuzzy ball. This is where the term ‘electron cloud’ is most appropriate. This contribution was universally recognized as being one of the cost important contributions of the 20th century, and one which triggered a revolution in the fields of physics, quantum mechanics and indeed all the sciences. Thenceforth, scientists were no longer working in a universe characterized by absolutes of time and space, but in quantum uncertainties and time-space relativity! We have written many interesting articles about atoms and atomic models here at Universe Today. Here’s What Is John Dalton’s Atomic Model?, What Is The Plum Pudding Model?, What Is Bohr’s Atomic Model?, Who Was Democritus?, and What Are The Parts Of An Atom? For more information, be sure to check What Is Quantum Mechanics? from Live Science. At the end of the millennium, Physics World magazine conducted a poll where they asked 100 of the world’s leading physicists who they considered to be the top 10 greatest scientist of all time. The number one scientist they identified was Albert Einstein, with Sir Isaac Newton coming in second. Beyond being the most famous scientist who ever lived, Albert Einstein is also a household name, synonymous with genius and endless creativity. As the discoverer of Special and General Relativity, Einstein revolutionized our understanding of time, space, and universe. This discovery, along with the development of quantum mechanics, effectively brought to an end the era of Newtonian Physics and gave rise to the modern age. Whereas the previous two centuries had been characterized by universal gravitation and fixed frames of reference, Einstein helped usher in an age of uncertainty, black holes and “scary action at a distance”. Is There a Mirror Universe? Could there be a mirror universe, where everything is backwards – and everybody has goatees? How badly do you need to bend the laws of physics to make this happen? One of the great mysteries in cosmology is why the Universe is mostly matter and not antimatter. If you want to learn more about that specific subject, you can click here and watch an episode all about that. During the Big Bang, nearly equal amounts of matter and antimatter were created, and subsequently annihilated. Nearly equal. And so we’re left with a Universe made of matter. But could there be antimatter stars out there? With antimatter planets in orbit. Could there be a backwards Universe that operates just like our regular Universe, but everything’s made of antimatter? And if it’s out there, does it have to be evil? Do they only know how to conquer? Does everyone, even the antimatter babies and ladies, have handsome goatees? How about sashes? I hear they’re big on sashes. OOH and daggers. Gold daggers with little teensy antimatter emeralds and rubies. Antimatter, without the goatee, was theorized in 1928 by Paul Dirac, who realized that one implication of quantum physics was that you could get electrons that had a positive charge instead of a negative charge. They were discovered by Carl D. Anderson just 4 years later, which he named “positron” for positive electron. We believe he was clearly snubbing Dirac, by not naming them the “Diracitron”, alternately they were saving that name for a giant Japanese robot. These antiparticles are created through high energy particle collisions happening naturally in the Universe, or unnaturally inside our “laugh in the face of God and nature” particle accelerators. We can even detect the annihilation out there in the Universe where matter and antimatter crash into each other. Physicists have discovered a range of anti-particles. Anti-protons, anti-neutrons, anti-hydrogen, anti-helium. To date, there’s been no evidence of any goatees or sashes. Naturally, they wondered what might happen if the balance of the Universe was flipped. What if we had a Universe made out of mostly antimatter? Would it still… you know, work? Could you have antimatter stars, antimatter planets, and even those antimatter people we mentioned? When physics swap out matter for anti-matter in their equations, they call it charge conjugation. It turns out, no. If you reversed the charge of all the particles in the Universe, it wouldn’t evolve in the same way as our “plain old non-sashed” Universe. To fix this problem, physicists considered the implications if you had an actual mirror Universe, where all the particles behaved as if they were mirror images of themselves. This sounds a little more in line with our “Through a mirror, darkly” goatee and sash every day festival universe. This is all the bits backwards. Spin, charge, velocity, the works. They called this parity inversion. So, would this work? Again, it turns out that the answer is no. It would almost work out, but there’s a tendency for the weak nuclear force, the one the governs nuclear decay to violate this idea of parity inversion. Even in a mirror Universe, the weak nuclear force is left-handed. Dammit, weak nuclear force, get your act together, if not just for the sake of the costumes and cooler bridge lighting. What if you reversed both the charge and the parity at the same time? What if you had antimatter in a mirror Universe? Physicists called this charge-parity symmetry, or CP symmetry. In a dazzling experiment and absolute “what if” one-upmanship exercise by James Cronin and Val Fitch in 1964. They demonstrated that no, you can’t have a mirror-antimatter Universe evolve with our physical laws. This experiment won the Nobel Prize in 1980. Physicists had one last trick up their sleeves. It turns out that if you reverse time itself as well as making everything out of antimatter and holding it up to a mirror, you get true symmetry. All the physical lays are preserved, and you’d get a Universe that would look exactly like our own. It turns out we could live in a mirror Universe, as long as you were willing to reverse the charge of every particle and run time backwards. And if you did, it would be indistinguishable from the Universe we actually live in. Now, if you’ll excuse me, I think I need to call my tailor, I hear sashes are going to be huge this year. So what do you think, do we live in the real Universe or the mirror Universe? Tell us in the comments below. This new video from PHD Comics provides a combination of live action and animation to try to explain entanglement. In 1988, John Cardy asked if there was a c-theorem in four dimensions. At the time, he reasonably expected his work on theories of quantum particles and fields to be professionally put to the test… But it never happened. Now – a quarter of a century later – it seems he was right. His speculation is the a-theorem… a multitude of avenues in which quantum fields can be energetically excited (a) is always greater at high energies than at low energies. 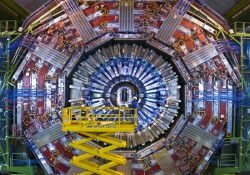 If this theory is correct, then it likely will explain physics beyond the current model and shed light on any possible unknown particles yet to be revealed by the Large Hadron Collider (LHC) at CERN, Europe’s particle physics lab near Geneva, Switzerland. According to theorists Zohar Komargodski and Adam Schwimmer of the Weizmann Institute of Science in Rehovot, Israel, the proof of Cardy’s theories was presented July 2011, and is slowly gaining notoriety among the scientific community as other theoretical physicists take note of his work. “I think it’s quite likely to be right,” says Nathan Seiberg, a theoretical physicist at the Institute of Advanced Study in Princeton, New Jersey. The field of quantum theory always stands on shaky ground… it seems that no one can be 100% accurate on their guesses of how particles should behave. According to the Nature news release, one example is quantum chromodynamics — the theory of the strong nuclear force that describes the interactions between quarks and gluons. That lack leaves physicists struggling to relate physics at the high-energy, short-distance scale of quarks to the physics at longer-distance, lower-energy scales, such as that of protons and neutrons. “Although lots of work has gone into relating short- and long-distance scales for particular quantum field theories, there are relatively few general principles that do this for all theories that can exist,” says Robert Myers, a theoretical physicist at the Perimeter Institute in Waterloo, Canada. According to Nature, Ken Intriligator, a theoretical physicist at the University of California, San Diego, agrees, adding that whereas mathematicians require proofs to be watertight, physicists tend to be satisfied by proofs that seem mostly right, and intrigued by any avenues to be pursued in more depth. Writing on his blog on November 9, Matt Strassler, a theoretical physicist at Rutgers University in New Brunswick, New Jersey, described the proof as “striking” because the whole argument follows once one elegant technical idea has been established. With Cardy’s theory more thoroughly tested, chances are it will be applied more universally in the areas of quantum field theories. This may unify physics, including the area of supersymmetry and aid the findings with the LHC. The a-theorem “will be a guiding tool for theorists trying to understand the physics”, predicts Myers. Pehaps Cardy’s work will even expand into condensed matter physics, an area where quantum field theories are used to elucidate on new states of materials. The only problem is the a-theorem has only had proof in two and four dimensions – where a few areas of condensed matter physics embrace layers containing just three dimensions – two in space and one in time. However, Myers states that they’ll continue to work on a version of the theorem in odd numbers of dimensions. “I’m just hoping it won’t take another 20 years,” he says. Original Story Source: Nature News Release. For Further Reading: On Renormalization Group Flows in Four Dimensions. What Is The Double Slit Experiment? Light… is it a particle or a wave? What fundamental mechanics govern the behavior of it? And most importantly, does the mere act of observation alter this behavior? This is the conundrum quantum physicists have been puzzling over for many centuries, ever since photon-wave mechanics was theorized and the Double Slit experiment was first conducted. Also known as Young’s experiment, this involved particle beams or coherent waves passing through two closely-spaced slits, the purpose of which was to measure the resulting impacts on a screen behind them. In quantum mechanics the double-slit experiment demonstrated the inseparability of the wave and particle natures of light and other quantum particles. The Double Slit Experiment was first conducting by Thomas Young back in 1803, although Sir Isaac Newton is said to have performed a similar experiment in his own time. During the original experiments, Newton shone light on a small hair, whereas Young used a slip of card with a slit cut into it. More recently, scientists have used a point light source to illuminate a thin plate with two parallel slits, and the light passing through the slits strikes a screen behind them. Relying on classical particle theory, the results of the experiment should have corresponded to the slits, the impacts on the screen appearing in two vertical lines. However, this was not the case. The results showed in many circumstances a pattern of interference, something which could only occur if wave patterns had been involved. Classical particles do not interfere with each other; they merely collide. If classical particles are fired in a straight line through a slit they will all strike the screen in a pattern the same size and shape as the slit. Where there are two open slits, the resulting pattern will simply be the sum of the two single-slit patterns (two vertical lines). But again and again, the experiment demonstrated that the coherent beams of light were interfering, creating a pattern of bright and dark bands on the screen. However, the bands on the screen were always found to be absorbed as though it were composed of discrete particles (aka. photons). To make matters even more confusing, measuring devices were put in place to observe the photons as they passed through the slits. When this was done, the photons appeared in the form of particles and their impacts on the screen corresponded to the slits, tiny particle-sized spots distributed in straight vertical lines. By placing an observation device in place, the wave function of the photons collapsed and the light behaved as classical particles once more! This could only be resolved by claiming that light behaves as both a particle and a wave, and that observing them causes the range of behavioral possibilities to narrow to the point where their behavior become predictable once more. The Double Slit experiment not only gave rise to the particle-wave theory of photons, it also made scientists aware of the incredible, confounding world of quantum mechanics, where nothing is predictable, everything is relative, and the observer is no longer a passive subject, but an active participant with the power to change the outcome. For an animated demonstration of the Double Slit experiment, click here. We have written many articles about the Double Slit Experiment for Universe Today. Here’s an a forum discussion about a home-made double slit experiment, and here’s an article about the wave-particle duality. If you’d like more info on the double slit experiment, check out these articles from Physorg.com and Space.com. We’ve also recorded an entire episode of Astronomy Cast all about Quantum Mechanics. Listen here, Episode 138: Quantum Mechanics.